Memphis Light, Gas and Water's Electric Outage Summary Map provides you general information about the outage level across Shelby County. Detailed information about specific addresses is not available for home safety and security measures. All information displayed on this site is based on reported and known outages. 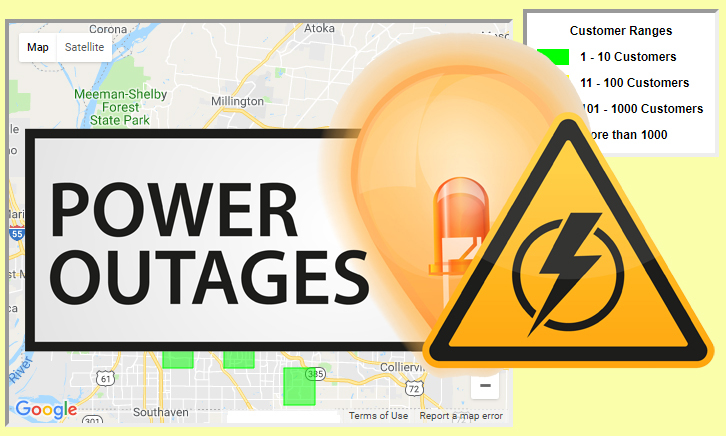 For information about your specific outage, or if you have an outage and the section of the map you are in doesn't show any outages, call MLGW's Electric Outage Hotline, (901) 544-6500. Important Note: Customers using Internet Explorer 8 or older may not be able to access the outage map due to compatibility issues between IE 8 and Google Maps. Remember to keep your telephone number(s) updated with MLGW so we can provide you with faster service when reporting outages. Allow MLGW to contact customers of planned outages with our automated notification dialer. Allow customers to report an electrical outage by telephone using the telephone number associated with their account. Allow customers to obtain electrical restoration status by telephone using the telephone number associated with their account. Residential customers can call (901) 544-6549 Tuesday - Thursday from 5:30 p.m. - 7:00 p.m.
Commercial customers can call (901) 544-6549, Tuesday - Thursday from 10:00 a.m. - 12:00 p.m.